For anyone who reads my posts, you will know I call myself the Intranet Pioneer. 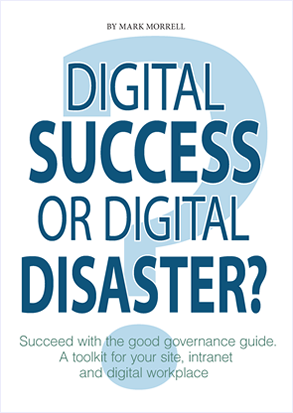 Recently I met a friend and digital consultant who jokingly referred to me as the “Intranet Guv’nor” because of my book about governance ‘Digital success or digital disaster ‘ that helps show people how to manage their intranets and other digital spaces better. While I appreciated the joke, it did make me think about the meaning of governance. Depending on who you ask, you will get a different response on what they think it is. Sometimes it even creates a sense of fear! People think it is ‘bad’ because it will stop you doing ‘good things’ online. What do I mean by governance? It is a word which has been described in different ways by many people with lots of diagrams and flow charts. However, the problem is not what governance is for – it is how you apply it online. So let me be very clear here. Governance is good and can be easy to apply well within an overall framework. I have found the best intranets help people to be more productive and effective. A consistently good overall experience helps achieve these benefits. People need this every time they use your intranet. Whatever people want to do, they need to be able to rely on your intranet delivering it. It needs to give them confidence that it will always meet their requirements. Without this, people will be less productive and effective with their work. This benefits their organisation too. People use their intranet more frequently. They are confident they can easily find what they need. They know they can rely on the integrity of the information and applications. It is having a strong governance framework supports an intranet or digital strategy, aligned with the organisation’s strategy. It is not enough just to set up a governance framework underpinning your strategy. While they are prerequisites for a well-managed intranet, you also need to measure and demonstrate the benefits the intranet provides for your organisation, especially if you need further investment in the intranet or its governance. Choose how to measure the benefits your intranet provides. Decide when is a good time to measure the benefits e.g. interviewing people before and after a major change to assess its impact on their work activities. There are different approaches to take when you measure these benefits. Consider how much time you have to measure the benefits, what resources you can call upon, and whether you need wider expertise. Be clear who is responsible for the content, design and structure of it. Have a governance framework that supports stakeholders, partners and publishers. While it is vital you have a big impact when you launch a new intranet, it is not just about creating a great design on day 1. It is the ongoing need to appeal to people to continue using it. Content and applications that people need are, of course, helpful but having good governance is the only way to make sure the benefits of day 1 continue consistently through to day 100 and onwards during the lifetime of your intranet. These can be the crucial factors that help your new intranet. Quicker adoption, increased usage and higher satisfaction are all achieveable if you take the right approach with governance. I find these factors encourage people using your intranet to be more effective and improve their productivity, bringing greater benefits to your organisation. It helps your stakeholders to see how your intranet can be a critical business tool that supports their key priorities!